This article covers how SELinux policy is built. SELinux policy is built from the combination of core AOSP policy (platform) and device-specific policy (vendor). The SELinux policy build flow for Android 4.4 through Android 7.0 merged all sepolicy fragments then generated monolithic files in the root directory. This meant that SoC vendors and ODM manufacturers modified boot.img (for non-A/B devices) or system.img (for A/B devices) every time policy was modified. In Android 8.0 and higher, platform and vendor policy is built separately. SOCs and OEMs can update their parts of the policy, build their images (vendor.img, boot.img, etc. ), then update those images independent of platform updates. However, as modularized SELinux policy files are stored on /vendor partitions, the init process must mount the system and vendor partitions earlier so it can read SELinux files from those partitions and merge them with core SELinux files in the system directory (before loading them into the kernel). external/selinux: External SELinux project, used to build HOST command line utilities to compile SELinux policy and labels. external/selinux/libselinux: Android uses only a subset of the external libselinux project along with some Android-specific customizations. For details, see external/selinux/README.android. chkcon: Determine if a security context is valid for a given binary policy (host executable). libsepol: SELinux library for manipulating binary security policies (host static/shared library, target static library). external/selinux/checkpolicy: SELinux policy compiler (host executables: checkpolicy, checkmodule, and dispol). Depends on libsepol. system/sepolicy: Core Android SELinux policy configurations, including contexts and policy files. Major sepolicy build logic is also here (system/sepolicy/Android.mk). For more details on the files in system/sepolicy Implementing SELinux. This section covers how SELinux policy is built in Android 7.x and earlier. 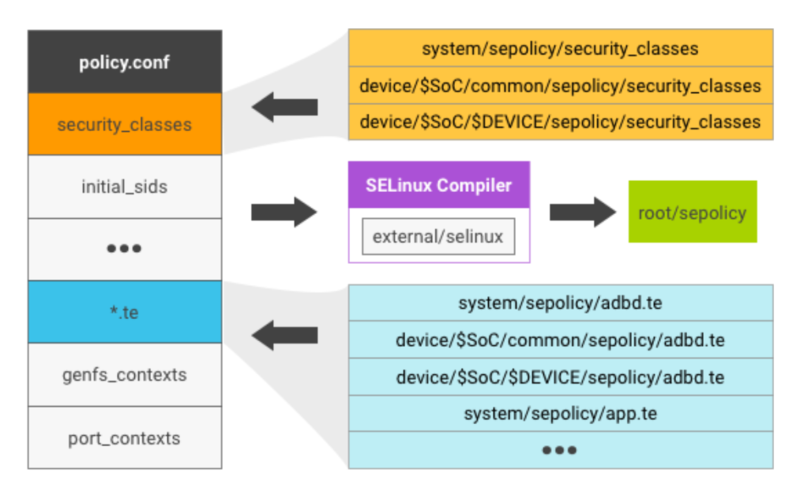 SELinux policy is created by combining the core AOSP policy with device-specific customizations. The combined policy is then passed to the policy compiler and various checkers. Device-specific customization is done through the BOARD_SEPOLICY_DIRS variable defined in device-specific Boardconfig.mk file. This global build variable contains a list of directories that specify the order in which to search for additional policy files. The plain text policy.conf is generated by concatenating security_classes, initial_sids, *.te files, genfs_contexts, and port_contexts in that order. For each file (such as security_classes), its content is the concatenation of the files with the same name under system/sepolicy/ and BOARDS_SEPOLICY_DIRS. The policy.conf is sent to SELinux compiler for syntax checking and compiled into binary format as sepolicy on the device. For more details, see Implementing SELinux. Loads sepolicy files from ramdisk into the kernel through /sys/fs/selinux/load. Switches SELinux to enforcing mode. Re-exec()s itself to apply the SELinux domain rule to itself. To shorten the boot time, perform the re-exec() on the init process as soon as possible. In Android 8.0, SELinux policy is split into platform and vendor components to allow independent platform/vendor policy updates while maintaining compatibility. The platform sepolicy is further split into platform private and platform public parts to export specific types and attributes to vendor policy writers. The platform public types/attributes are guaranteed to be maintained as stable APIs for a given platform version. Compatibility with previous platform public types/attributes can be guaranteed for several versions using platform mapping files. The platform public sepolicy includes everything defined under system/sepolicy/public. The platform can assume the types and attributes defined under public policy are stable APIs for a given platform version. This forms the part of the sepolicy that is exported by platform on which vendor (i.e. device) policy developers may write additional device-specific policy. Types are versioned according to the version of the policy that vendor files are written against, defined by the PLATFORM_SEPOLICY_VERSION build variable. The versioned public policy is then included with the vendor policy and (in its original form) in the platform policy. Thus, the final policy includes the private platform policy, the current platform's public sepolicy, the device-specific policy, and the versioned public policy corresponding to the platform version against which the device policy was written. The platform private sepolicy includes everything defined under /system/sepolicy/private. This part of the policy forms platform-only types, permissions, and attributes required for platform functionality. These are not exported to the vendor/device policy writers. Non-platform policy writers must not write their policy extensions based on types/attributes/rules defined in platform private sepolicy. Moreover, these rules are allowed to be modified or may disappear as part of a framework-only update. The platform private mapping includes policy statements that map the attributes exposed in platform public policy of the previous platform versions to the concrete types used in current platform public sepolicy. This ensures vendor policy that was written based on platform public attributes from the previous platform public sepolicy version(s) continues to work. The versioning is based on the PLATFORM_SEPOLICY_VERSION build variable set in AOSP for a given platform version. A separate mapping file exists for each previous platform version from which this platform is expected to accept vendor policy. For more details, see Compatibility. SELinux policy in Android 8.0 is made by combining pieces from /system and /vendor. Logic for setting this up appropriately is in /platform/system/sepolicy/Android.mk. Versioning the policy provided by public as part of the vendor policy. Done by using the produced public CIL policy to inform the combined public + vendor + BOARD_SEPOLICY_DIRS policy as to which parts must be turned into attributes that will be linked to the platform policy. Creating a mapping file linking the platform and vendor parts. Initially, this just links the types from the public policy with the corresponding attributes in the vendor policy; later it will also provide the basis for the file maintained in future platform versions, enabling compatibility with vendor policy targeting this platform version. Combining policy files (describe both on-device and precompiled solutions). Combine mapping, platform and vendor policy. Compile output binary policy file.